Product #21178 | SKU 041126 | 0.0 (no ratings yet) Thanks for your rating! The InVision INV-7 Pop Filter Kit from Rycote is a combined suspension / pop filter kit for high-quality shotgun microphones up to 250mm in length. The kit includes an InVision INV-7 suspension based on 2 Lyre webs, which will accommodate shotgun mics from 19 to 25mm in diameter. This helps broadcast professionals with a clean sound, free from unwanted cable or stand-borne noise. The suspension is combined with an InVision Pop Filter, allowing the mic to be used for voiceover or dialogue replacement work in studio. The InVision Pop Filter features a carefully-designed custom mesh which attenuates low-frequency pops and thumps by up to 20 dB without causing high-frequency loss. The foam mesh filter may also be removed for cleaning or replacement. 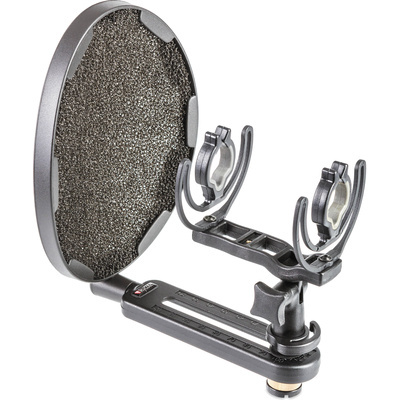 The complete InVision INV-7 Pop Filter Kit may be fitted to mic stands with 3/8 or 5/8" threads. Adapters for both the types are included in the kit.